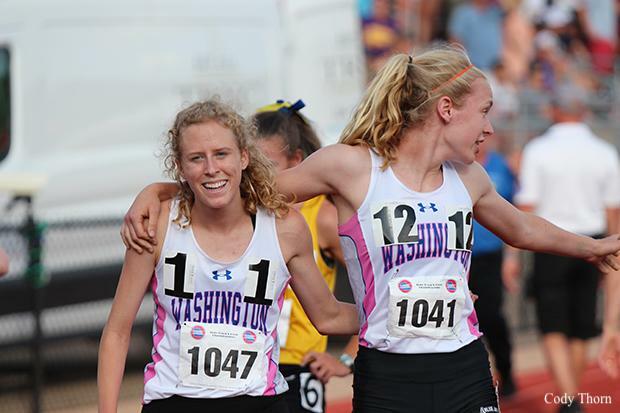 Washington moved down to Class 4 in 2017 and Mikayla Reed turned that into her first two state track championships, winning the 1600 and 3200 after winning the Class 4 cross country title. This weekend, she grabbed four more golds in what proved to be an impressive quadruple. Reed kicked off the weekend with a win and personal best in the 1600, running 4:58.21 and beating Bolivar's Kelie Henderson by seven seconds. Reed's teammate, Claire Ayers, coming back from last year's stress fracture, grabbed third in 5:08.81. A couple hours later, the Washington duo went 1-2 in the 800, scoring huge points for the Blue Jays in Day 1. Reed, in typical fashion, shot out to the front and never looked back until she came across in 2:15.26. 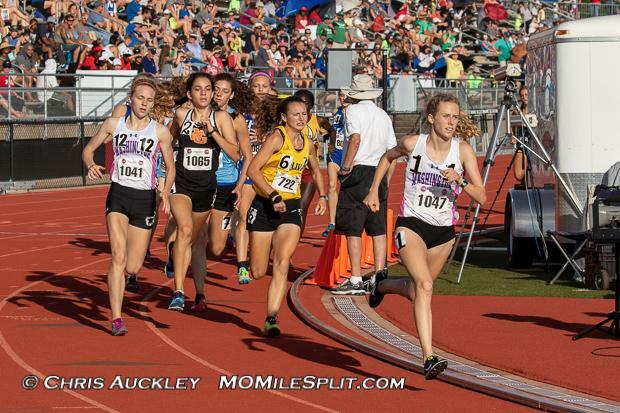 When she did turn around, though, she saw her teammate Ayers coming across in 2:16.05. "On the back stretch I heard someone yell 'you guys can go 1-2' and I went 'Oh my god!' so I just pushed as hard as I could down that last 100," Reed said after the race. "Honestly, it reminded me of...Courtney Frerichs and Emma Coburn like when they finished (at the World Championships)." Reed would anchor the girls 4x800 to a victory in 9:32.20, just .11 seconds off of their fastest state meet time from 2009. Her 2:16.62 was the fastest split of anyone in the field and her third championship of the weekend. Ayers led off in 2:22.51 and Mia Reed and Morgan Holdmeyer both split 2:24.81 and 2:28.55 respectively. And finally, in her last race of her high school career, Reed made it four-for-four as she cruised to victory in 11:10.14, 19 seconds ahead of West Plains sophomore Mia Harris. Reed finished her career with six individual gold medals, seven overall, and twelve career individual all-state medals. She will be one of the headliners of a stacked Class of 2018 recruiting class at the University of Missouri. 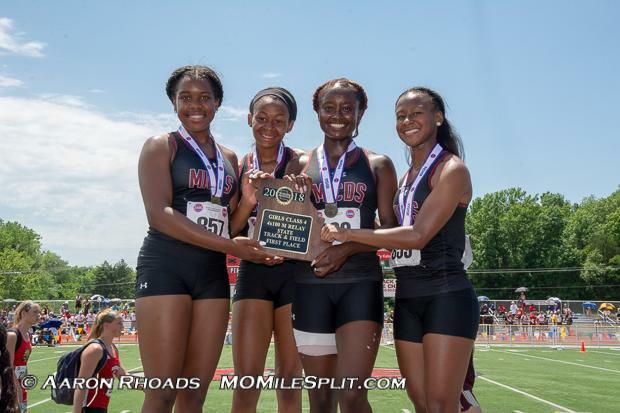 MICDS put on a show on Friday and Saturday, winning golds in the 4x100 and 4x200 and taking third in the 4x400 and seventh in the 4x800 for a stellar relay showing. Zionn Pearson added a long jump win and fourth in the triple jump. Palmer Mihalevich took sixth in the 800. But it may have been Cara Johnson and Jhordin Galmore who combined forces to really key the MICDS girls to the win. Johnson and Galmore both ran key legs on the 4x200 and 4x100, but their performances in the 100, 200, and 400 brought in significant double digit point totals for the Lady Rams. Johnson won the 100 in 12.06, Galmore won the 400 in 57.68, but they both combined forces to go 1-2 in the 200 with Galmore winning in 24.66 and Johnson taking second in 24.71. 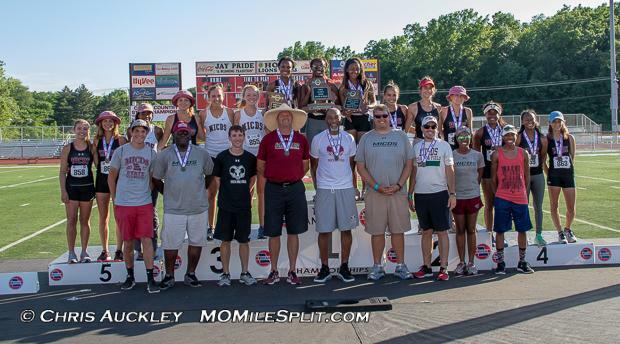 The Camdenton girls returned in the 2018 to defend their narrow one point victory as a team in 2017. While they fell victim to the MICDS buzzsaw this spring, Kylie Meier and Natalie Basham tore it up all weekend, doing their best to key the Lakers to the win. We talked to them after they went 1-2 in the 100 meter hurdles with Meier (14.89) taking the victory over Basham (14.92) this season after taking third in 2017 while Basham won. Meier and Basham both also ran legs on the runner-up 4x200 and runner-up 4x400. Meier won the 300 hurdles individually and Basham took seventh in the 400. It always seems to be a battle for the fourth place trophy in each class each year. So many teams seem to finish within a couple of points, but for Webster Groves, they were able to leap into that fourth place spot in Class 4. 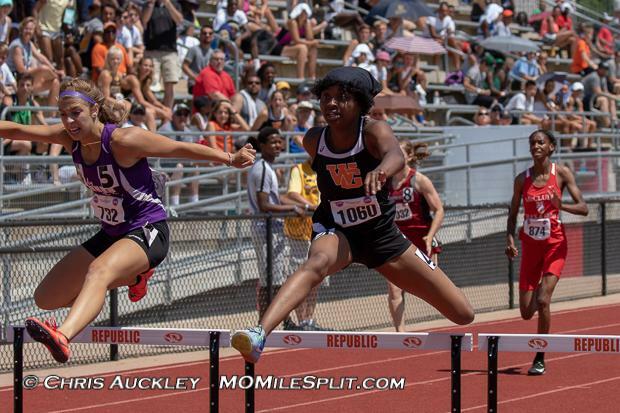 Sophomore Angelina Arinze was a major force behind the Webster Groves charge, though, as she anchored her squad to a fourth place finish in the 4x200, narrowly missed a victory in the 300 meter hurdles, and anchored the team to the win the 4x400. Arinze's 300 hurdles race came down to a lean as a result of an incredible comeback from Kylie Meier and, in the end, Meier would take the race by .02 seconds. She came back later, though, to seal the deal in the 4x400 with a 56.62 split, holding off Meier this time. She is no stranger to the state meet as she was fourth in last year's 300 meter hurdles and a part of the second place 4x200 and fourth place 4x400. Keep your eyes peeled for Arinze as she comes back for her junior year next year. 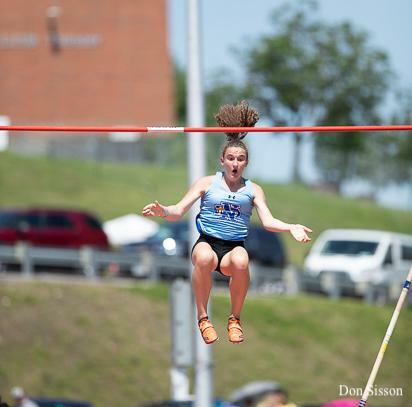 Girls Pole Vault: Notre Dame Cape Girardeau's Carly Pujol and Helias Catholic's Chloe Ramsey went height for height in the pole vault before Pujol cleared 12-6 to stave off Ramsey. Ramsey, who was only able to clear 12-3 this weekend, was the returning champion after going 12-6.25 last season and cleared 12-7.5 at the Great Southwest Classic last season. For Pujol, that was her first ever clearance of 12-0 and a full foot personal best. Talk about peaking at the right time. Girls Discus: Rosati-Kain junior Angelina White popped off a 12 foot personal best in the discus to go over 140 feet for the first time in her career and win the state championship by over six feet. Her 142-10 is a MO No. 4 and second in the state among returners. Girls Triple Jump: Riley Burger didn't jump until the district meet, but once she finally did, she didn't lose in either of the three postseason meets. The Notre Dame Cape junior went 40-2.25 for the win last May and was able to bring home the win again this year in 39-6. We already discussed MICDS's dominance above, but it can be hardly understated. 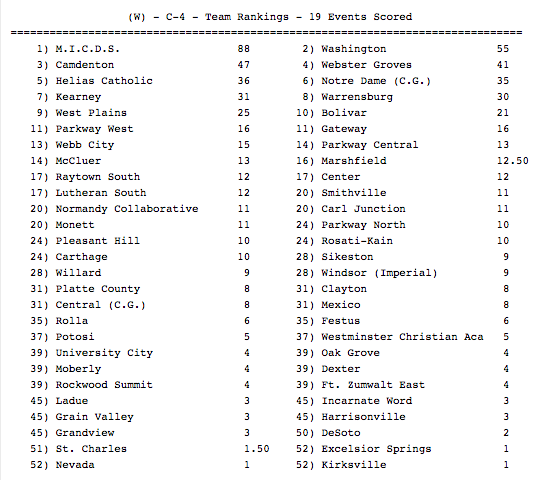 They actually scored the most points of any team this weekend, two more than Lee's Summit West's girls in Class 5. Washington got 44 points in the individual events from Mikayla Reed and Claire Ayers, another ten points in the 4x400 and their 55th point in the high jump from 5-2 clearing freshman Morgan Gratza. It was a big second place victory that was probably keyed by the high finishes from Claire Ayers in the 1600 and 800, considering Reed was the heavy favorite in the 800, 1600, and 3200. Camdenton could not repeat this year, but Kylie Meier and Natalie Basham were able to help them score all 44 points this weekend. 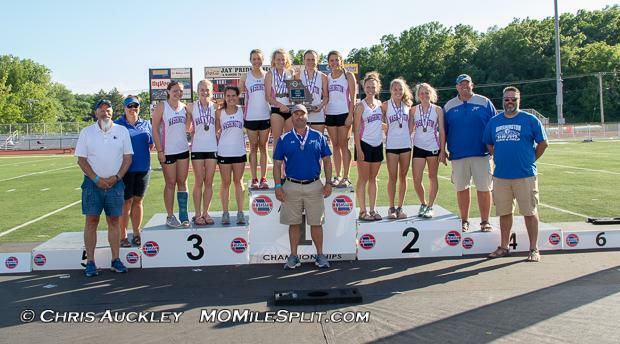 They almost did it single handedly, but with help in the 4x200 and 4x400 from Grace Wormek, Claire Holmes, and Katheryne Blackman gave them the 16 addition points they needed to jump into a podium spot. Webster Groves went a more diverse route to their fourth place finish. The afore-mentioned Arinze picked up second in the 300 meter hurdles and anchored the winning 4x400 and fourth place 4x200. Britney Clark took fourth in the 100 meter dash and fifth in the 200. Emma Kelley took fifth in the 800. The 4x100 also helped out with a fourth place finish.